Now here is an unusual offer. I picked these up in the Dominican Republic. 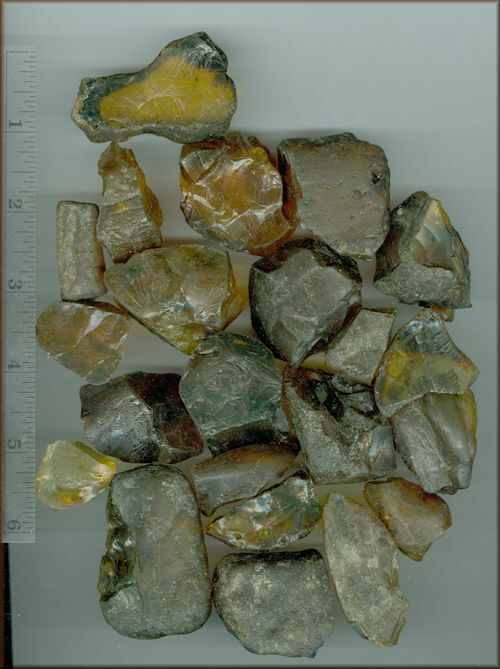 They are individual stones that have NOT been polished. The miner, a trustworthy soul (really), promised me that every single one of the pieces that I bought had a 'fossil' inside. He showed me the discard pile which was many times as large that did not have any fossils. He said "I will guarantee every piece here has fossil in it. If it doesn't, you bring back and I give money back." I looked, and many did have small fossils, but I found it very difficult to figure out what they were without the pieces being polished. What fun though - who knows what you will end up with. Price? We sell the amber by the gram. A typical good sized piece that is 2 x 1 x 1.5 inches (kind of what I think of when you say 'rock') weighs 14.3 grams. Many are larger and many smaller. Some are the same size except they are thinner (and thus less weight). This quality amber sells for $7 per gram. So the rock described above that weighs 14 grams would cost $98. This is beautiful stuff, no question about that. We guarentee you will love this amber.